Grand Opening of HarborChase of the Park Cities. 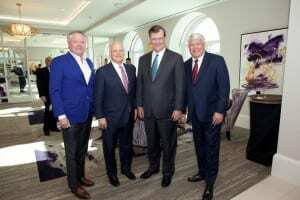 (L-R) Silverstone Healthcare co-founders John Goff and Denny Alberts, Dallas Mayor Mike Rawlings, and Tim Smick, chairman and managing partner of HRA, celebrate the debut of this flagship location. Talk about a stellar career track: The bio for Denny Alberts reads like a dream resume for developing high-end residential and business real estate. He currently serves as Chairman and Chief Executive Officer of Silverstone Capital Group, LLC and Silverstone Healthcare Company, LLC. Prior to that, he’s held the top titles at a gilt-edged roster of multibillion-dollar development companies which include (starting with most recent and working back) Crescent Real Estate Equities, Inc., Pacific Retail Trust, Rosewood Property Company, Trammell Crow Residential Company (only the largest multifamily and residential land development company in the United States), and all that after already achieving a role as EVP of InterFirst Bank in Dallas—a job most folks would regard as a career capstone, let alone their first big career step. So, what does a real estate star like Denny Alberts do for an encore? With respects to the Bard of Avon, for Denny, all that’s past was truly prologue. Today, he’s taken every iota of that trainload of development savvy to innovate one of the most luxurious and hospitality-honed senior lifestyle models in America. But there’s a special wrinkle to his story. It’s not so much what’s he’s building—as much as who he’s building if for. Read on to discover how a true industry leader can reshuffle the deck. THE TWIN HORSEMEN OF LUXURY AND HOSPITALITY have emerged as potent elements in the senior lifestyle industry. However, most of the superb design, top-tier dining and other “pizzazz” was directed toward the independent living end of the spectrum. Assisted living, skilled nursing and memory care might share in the upscale atmosphere as part of a high-end CCRC—but rarely feature top-end hospitality as “stand-alone” communities. The philosophy behind this approach seemed to be that independent seniors were the only ones still vital enough to enjoy—and expect—the very best. But one man saw it all quite differently. Meet Denny Alberts, a “game changer” by any definition. One glance at his bio above confirms that Denny is a man who knows how to combine luxury real estate with quintessential hospitality. His last project before leaving regular multifamily for senior lifestyle was a Ritz Carlton hotel. Something about that legendary boutique-style hotel setting resonated deeply with Denny, and he brought that perspective into his new chosen career of senior lifestyle developer. Think of it as Ritz Carlton meet activities of daily living. Now, as a master developer and CEO of Silverstone Healthcare, Denny has put his own stamp on the industry by putting the AL and MC folks at the front of the line for later-life “finery.” In fact, Denny and his partners at Silverstone have developed a “New Generation” of AL / MC properties which offer luxury second to none in the senior lifestyle sector—or any sector for that matter. The new model stands conventional thinking on its head. This innovative Silverstone concept culminates in the company’s flagship community, HarborChase of the Park Cities: an eight story, neo-Georgian edifice that sits within the posh Park Cities area of Dallas. Just opened, HarborChase of the Park Cities (HCPC) is an extravagant celebration of design, color, textures and creativity—with a different theme for each of the eight floors. It literally feels just like a world-class boutique hotel—no surprise—and pays off that promise with splendid amenities, elevated patios, superb dining options and a seemingly endless succession of elegant surprises in both form and function. What it doesn’t feel like is an AL or MC community, and that’s quite by design. 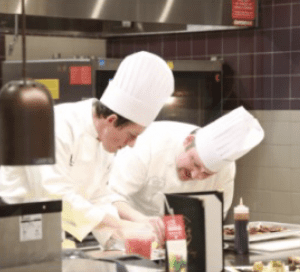 Chef prepared cuisine is standard fare at HCPC. The difference is that Denny Alberts saw a fresh vision for senor lifestyle, one that doesn’t fit aging Americans into rigid silos called IL, AL, MC and the rest. Denny wanted to develop a place anyone would aspire to live—a place where, amid your best boutique hotel adventure, you could receive whatever level of personal assistance you happened to need. Denny saw a vision not defined by a resident’s level of dependency—but by enabling them to enjoy the best of life to the fullest. The care levels are there, but they are invisible and organized in ways which render them virtually seamless in the overall community. As a result, HarborChase of the Park Cities is attractive to virtually any “empty nester.” In fact, Denny’s operating company, HRA, has had numerous inquiries from active-agers looking for an independent lifestyle—or they can opt for a light round of ADL support. At the other end, AL patients with more pressing nursing care needs can access expert nursing staff around the clock. Privacy and security blend with boundless opportunities for quality socializing. The luxurious community offers 134 assisted living and memory care apartments, with the second floor dedicated specifically for memory care residents. Blending traditional silos even more, HCPC offers two major memory care options: a neighborhood for minor cognitive impairment (called The Sound), and one for major cognitive loss (called The Cove). Every resident finds the envelope of support and hospitality form fitted to their personal needs. To be sure, this model falls into the affluent end of the market scale, and Silverstone looks for upscale suburban infill locations, such as the one in Park Cities in Dallas. The New Generation model not only offers an entirely new standard for resident experience, it also offers owners and operators some operational benefits as well. For example, by attracting a younger and more active than average AL resident, the community will be insulated from the usual 18-24 month turnover rate that challenges most AL providers. By offering a higher level of AL nursing care, HCPC is truly competitive against home health care providers, which his very affluent market base can easily afford. By offering it all as a rental model, the timeframe for acquiring new occupants can be measured in mere days. Finally, the high-end luxury appeals to adult children who only want the best for their parents—and who most often make the final buying decision. Visits are more enjoyable as well. Not surprisingly, the market has responded enthusiastically to the new model, and Silverstone Healthcare Company has already developed six upscale senior living communities in Texas, Florida and Virginia. Other Silverstone communities include HarborChase of Southlake, HarborChase of Palm Beach Gardens and HarborChase of Wellington Crossing in Florida, and HarborChase of Prince William Commons in Virginia—with more planned. Nobody sums up the success of the business better than founder Denny Alberts. What Elements Made Silverstone a “Long Game” Winner? 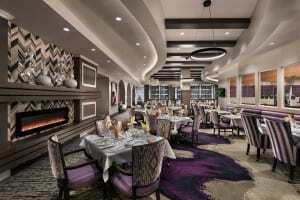 HCPC dinning areas rival top hotel restaurants. Why is this New Generation concept winning in the long game? Let’s start with innovation. Silverstone was willing to consider new possibilities and color outside the lines of standard senior living assumptions. In so doing, they created a new and different spectrum of care encompassed by an envelope of boutique luxury that communicates to residents that they are as important as any senior resident—anywhere. They crafted a package that registers with a real and enduring segment that won’t settle for less than the very best: ultra-affluent seniors. There are lessons to be drawn. A solid long game, by definition, means isolating a market segment with “legs” and bringing all their key “care abouts” into crystal clarity. Companies must then get a hard fix on their target demographics—and psychographics—and focus their resources with laser-like precision to deliver a unique value to that target. Silverstone did just that. In some ways, Silverstone even created their own larger market by providing a lifestyle environment which will attract younger residents who will stay at the community much longer. As a result, Silverstone properties should tend to dominate the top-end AL/MC in every market they enter. We hope you have enjoyed this issue of The Long Game blog powered by The Point Group. We invite you to follow us by subscribing below, and continue enjoying the wealth of insights from our featured thought leaders in the fields of Senior Lifestyle, Real Estate, Hospitality, Health Care, and Technology.